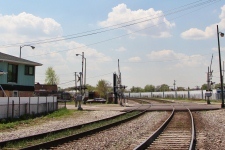 The Illinois Department of Transportation has initiated the Central Avenue at Belt Railway Company of Chicago (BRC) Railroad Grade Separation Study. 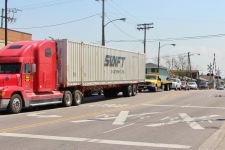 The goal of the study is to recommend a transportation solution that will reduce roadway congestion and improve safety in the Garfield Ridge community on the southwest side of the City of Chicago by eliminating delay to nearly 2,500 vehicles per day and alleviating the collision potential between vehicles and trains. The fifth CAG meeting was held on August 7, 2014 from 1:30pm to 3:30pm at the Garfield Ridge Public Library. For more information on this meeting or previous CAG meetings, please click here. 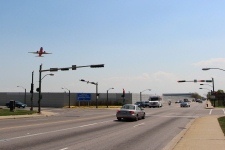 This study’s purpose is to identify and describe the potential positive and adverse impacts of potential alternatives under consideration, and is scheduled to take approximately 18 months to complete. A grade separation improvement at this location was identified as GS2 in the Chicago Region Environmental and Transportation Efficiency (CREATE) Program. CREATE is a first-of-its-kind partnership between the United States Department of Transportation, the State of Illinois, the City of Chicago, Metra, Amtrak, and the nation’s freight railroads which is funding critically needed improvements to increase the efficiency of the region’s passenger and freight rail infrastructure and enhance the quality of life for Chicago-area residents. The study is being funded under the CREATE program. Please browse this site to learn more about the Central Avenue at BRC Railroad Grade Separation Study and find out how you can get involved here.